A traditional dressed natural flag providing durability and elegance is available in the popular 600 series. Sandstone available in Project Pack calibrated 24mm thick. Selected sandstone colours available in calibrated single sizes. Some sandstone Project Packs are still available in the hand-cut 25-40mm thicknesses. Limestone Project Packs and some Single Sizes are available in hand-cut 20-30mm thicknesses. When laid, a Calibrated Project Pack covers an area of approximately 18.9m squared. All other Project Packs when laid cover an area of approximately 15.25m squared. 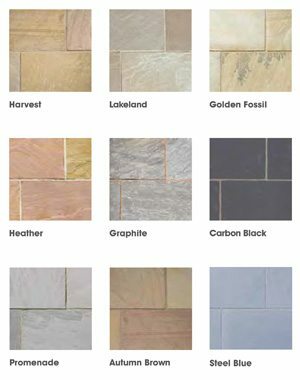 We hold all of the above paving colours in stock in calibrated project packs. We do not stock Graphite or Steel Blue. We can order these but they have a 2/3 day lead time. Please call for more details. Please click here for Natural Paving’s full range of landscaping materials. Jack Poulton & Sons Ltd. provide next day and where possible same day delivery service to Buntingford, Ware, Hertford, Cheshunt, Hoddesdon, Bishops Stortford, Sawbridgeworth, Saffron Walden, Stevenage, Letchworth, Baldock, Royston, Cambridge, Stansted and many other local towns and villages.